I wasn’t in Maui in 2016 for the last mud-fest, so I did not have those memories with me when I lined up to race this year. Everyone knew it was going to be a long day on the course, and that there was going to be some amount of bike-hiking involved, and each had to decide how they were going to personally get the best of themselves on that day - really no different from the approach to any race, maybe with a couple of extra challenges. As well as the extreme mud, the surf made an appearance for us as well, adding more to the challenge of the day, but I knew I was ready to take the day as it came and work my way through the conditions as best as I was able to with the preparation I had done. I entered the water well, got out past the break far better than I have every done before and got swimming strong and smooth to the first buoy. Only about 200 yards into our day, a fellow female age group athlete swam through a tight ‘gap’ on my right hand side, and my stroking arm did contact her head while I just held my line and kept swimming. The next thing I knew she stopped her race, turned to look at me, grabbed me by the head and waist and dunked me. I had realized what was happening just in time to take a big gulp of air before I was submerged and was able to wait it out, gather my thoughts, fight the urge to retaliate and get back to the task at hand. I’ve raced enough triathlons to have dealt with flailing limbs and rough starts with people full of adrenaline but never have I been intentionally dunked. I really was not sure what to make of it and just hope that whoever it was never does that to anyone else again as it could have quite easily ended very differently. The rest of the swim, I did my best to sight well, not fight the surf and stay smart and strong, I rode a wave in from the first loop, of the swim and headed out for the second loop through the biggest waves of our day feeling good about my strategy. I exited the water unharmed and in as good a position as I’ve ever been in from the swim, my dunking experience now far behind me. I took my time in transition, maybe a bit too much, but I knew it was going to be a long bike ride/hike and I wanted to make sure I was sticking with my ‘smooth is fast’ strategy I’d planned for the day. As expected, much of the first half of the bike was not ride-able; a combination of mud build-up on wheels and drive-train prevented said parts from moving as they should, and even when wheels were rolling there often was zero traction on tire or on foot. Many strategies were employed by myself and all those around me to attempt to find footing to be able to lug a mud-laden bike up the steep and very slick hills in the first few miles of the course. My full suspension linkage appeared to be one of the most adept mud-collecting designs out there but most people were not much better off. At least I had mud-tires (Maxiss Forekaster’s) that when my wheels were turning really did perform very well. Maybe a slightly skinnier rear tire and as many metal studs as possible in my bike shoes would have made forward progress a bit faster, but I had what I had and I just moved on as fast as was possible by whichever method I could! Fitness-wise I was probably the best prepared I’d ever been for this race, with confidence in both my swim and run for once, and not just the bike leg. Coming off the bike, I was in a solid space mentally and knew I’d done what I could with what I had in the bike conditions, and I was ready to put a strong run together. I enjoyed the run the most I ever have on Maui, I had good legs, was well fueled and did not feel the heat too badly at all (it was a cooler year than usual as well I think). I slipped and slid around pretending I was running in snow and ice (my winter spiked shoes would sure have been nice however…), and used any method I could think of to move up and down the hills as fast as possible. For the first time ever in Maui, the run flew by and I was making my way along the sand, not knowing what position I was in and really not too worried about it. I’d enjoyed my day, done what I could, kept myself and my bike in one piece, and put together a swim, bike and run I was proud of. 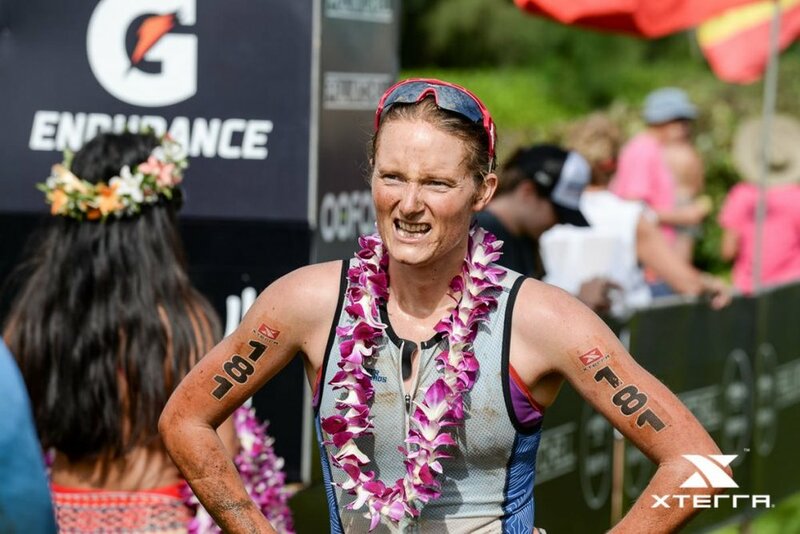 Turns out I finished 4th (for the 4th time in Maui I missed the podium by not very much) which honestly, with my usually strong bike leg tempered by the conditions meant that I’d probably put together the best swim and run I ever have here.